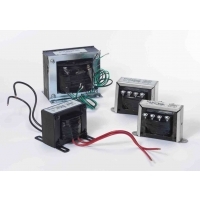 When fixed terminals are not required, these transformers are supplied to OEM customers to their specified requirements in wire length and guage of both primary and secondary flexible leads. Units are often used with "o-ring" connections for those customers requiring multiple voltages with either continuous or isolated secondaries. These open type industrial control transformers can be supplied with color-coded leads for easy identification, thus reducing installation costs and providing greater flexibility to the OEM technician. Available from 25VA in a full range of voltage combinations.